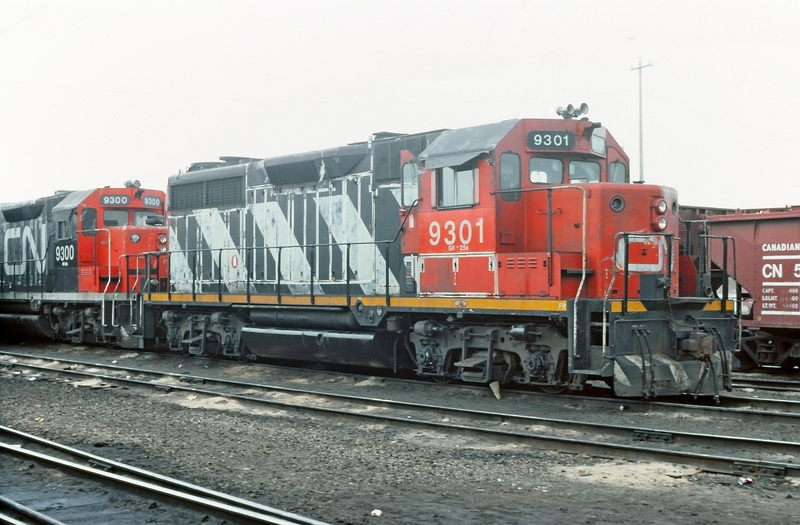 Railpictures.ca - Doug Lawson Photo: CN 9301 and 9300 on the shop track at Calder Yard, now known as Walker Yard. Bell and classification lights missing on the 9301 as well as being dead and drained, obviously not fit for service. My info is that the 9301 was originally numbered CN 4001 and one of two GP35′s that CN had. Any info about these units greatly appreciated. | Railpictures.ca – Canadian Railway Photography – photographie ferroviaire Canadienne. Caption: CN 9301 and 9300 on the shop track at Calder Yard, now known as Walker Yard. Bell and classification lights missing on the 9301 as well as being dead and drained, obviously not fit for service. My info is that the 9301 was originally numbered CN 4001 and one of two GP35's that CN had. Any info about these units greatly appreciated. Doug, the CNRHA lists 9301 as “scrapped at Mandak Metals, Selkirk MB”, so seems not to have had the post CN career that 9301 did. Always appreciate seeing quality shots of these two given their relative obscurity in CN’s large GM fleet.